If you’re in the business of producing, distributing or transporting perishable foods in the United States, you won’t want to miss our live webinar hosted by ORBCOMM and TMW on February 16. 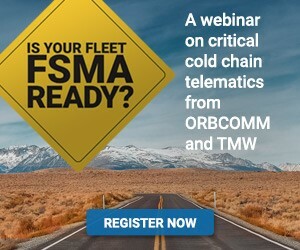 Learn how the Food Safety Modernization Act (FSMA) will affect your business, get some valuable insight from industry experts about getting ready for FSMA and see how ORBCOMM-TMW cold chain telematics can help you comply. This session will be presented by Christoph Kalinski, VP Food Safety and Pharmaceutical Solutions at ORBCOMM, Chris Corlee, Pre-Sales Engineer and TMS Integration Specialist at ORBCOMM and Brian Larwig, VP & GM Appian and Business Intelligence at TMW Systems. TMW Systems’ integration with ORBCOMM’s asset tracking solutions provides carriers a centralized view of the location of their assets as well as the ability to monitor critical cargo temperatures and sensor readings, receive alarm events and prevent spoilage claims. To learn more, visit www.orbcomm.com/tmw.